About a dozen or so years ago we planted a small Bald Cypress tree near the river bank. It was just a small sprout when it started but now reaches up higher than the roof of the house. We called it “The General” because it stood so tall and straight and had a commanding view of the Broward. Each year another foot or so of new growth would sprout at the top. 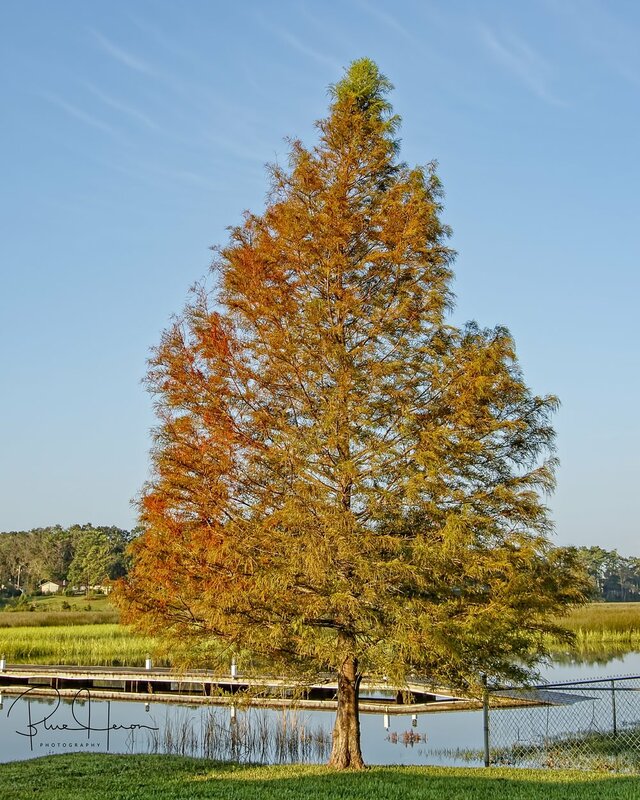 Bald Cypress are deciduous in that they annually lose their leaves but not before they turn golden red at the herald of fall. The General is starting to turn that golden fall hue. But now he is not so straight anymore. The top five or six feet now have a permanent bend due to Irma’s winds. The recent hurricanes in Texas, Florida and the Caribbean have wrought a path of destruction unlike any in recent history. Most in Puerto Rico were not alive when a Category 4 storm last struck a direct hit in 1932. As we see what damage is done from the comfort of our air-conditioned homes we can only hope and pray that the entire world will come to the aid of these devastated areas and restore hope, provision, and power and help them rebuild. However, I don’t see the United Nations jumping to their aide. Not a peep heard in the news any more. Where is "World Relief" Organization? Perhaps they are too busy going on shopping sprees in New York. Why is this? Thousands of crows (with Jersey accents) have arrived..
Litlle Boy Blue the Little Blue Heron is blowing his horn.. When you pass through the waters..
We have weathered the storm. Thank all of you who prayed for us and for all those affected by Hurricane Irma. It was a storm of devastation unlike any in recent history some say. We have been in this home nearly 20 years, our neighbor has been here over twice that long and have never seen the waters so high. Still, we are fortunate and blessed. Many in Florida, the Virgin Islands, and elsewhere were not so lucky. Please continue to pray for their recovery, it may be a long time a coming. Here on the Broward River there was indeed damage. We have neighbors a few houses down with a huge tree through the roof, one across the street narrowly missed their home. Another neighbor nearly lost her leg (and is fighting for her life) from a tree impaling her to her bed. Sadly, the tree which has been home to our local Black-crowned Night Herons (and yes, George’s home too), has fallen into the Broward. Happily, I can report they are still in the area. George usually leaves about this time of year so I don’t expect to see them much longer. I pray this avian family returns next spring to the area. 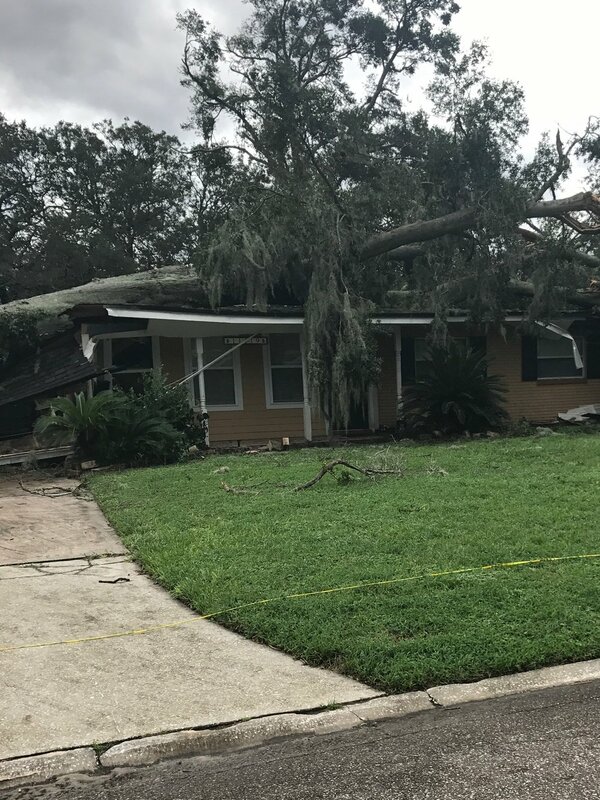 We invited some friends (USNA classmate) and some of their family to take refuge here during the hurricane as they were under mandatory evacuation. My generator was ready and we had power all through the storm until local power was restored (within a day of Irma passing). 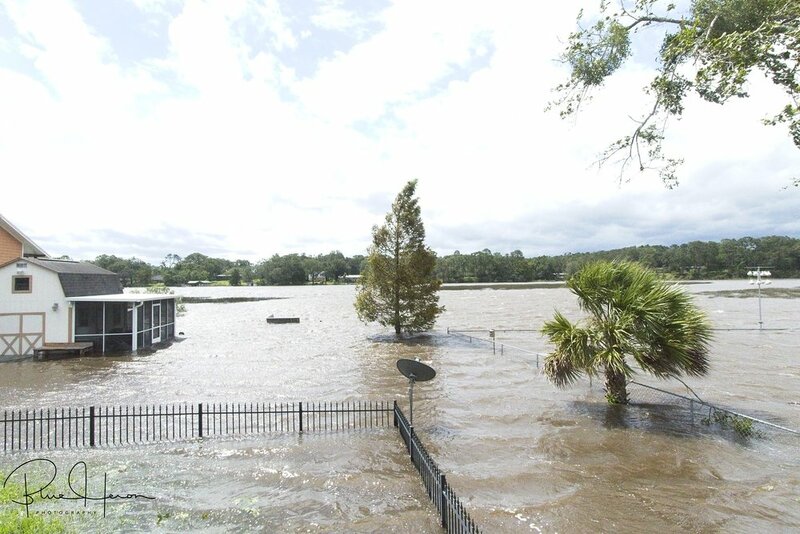 We watched with trepidation as water levels all over Jacksonville began to rise and overflow the banks of the local rivers and streams. The Broward overflowed its bounds and flooded the Editor’s recently renovated She Shed and came up to the back of the house. Fortunately, we had another four feet to go before it could breech our home. At one point, I am sure our guests were wondering if they made the right decision to come here. Through it all, we were fine and so was their homes when they returned. Our house guests began to wonder if they came to the right place to avoid the storm..view of my back "yard" during Irma. 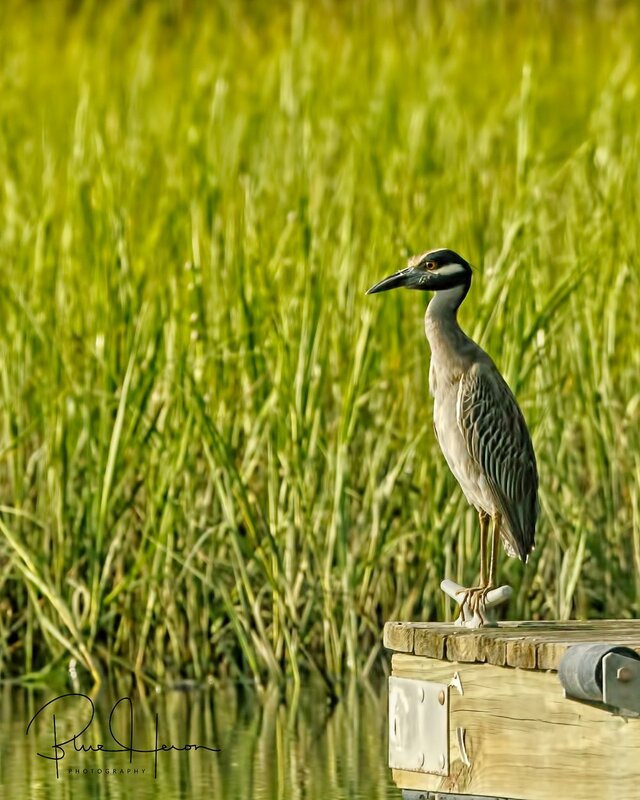 George, the Yellow-crowned Night Heron sits on the dock and stares ..
After the storm..."You will pass through the waters...and they will not sweep over you"....what a promise..
As I write this blog, one of the most powerful hurricanes in history (Irma) is churning up central Florida. These past few weeks as most of us sat in our comfortable homes and observed the devastation and flooding in Texas and Louisiana from Harvey, I knew the hurricane season was still far from over. While we were looking to see how we could help in Texas, Irma was forming and is she ever one angry powerful storm. This past week’s priorities quickly changed from photography to preparations. It is family first, other things are just temporary. Speaking of family, one of my favorite Broward bird families is that of “George”, the Yellow-crowned Night Heron. Each spring he shows up walking around my dock looking for crabs and other tasty morsels. There is a tree next door that George has called his summer home for over a decade now. I am not sure this is the original “George” or one of his grandchildren. 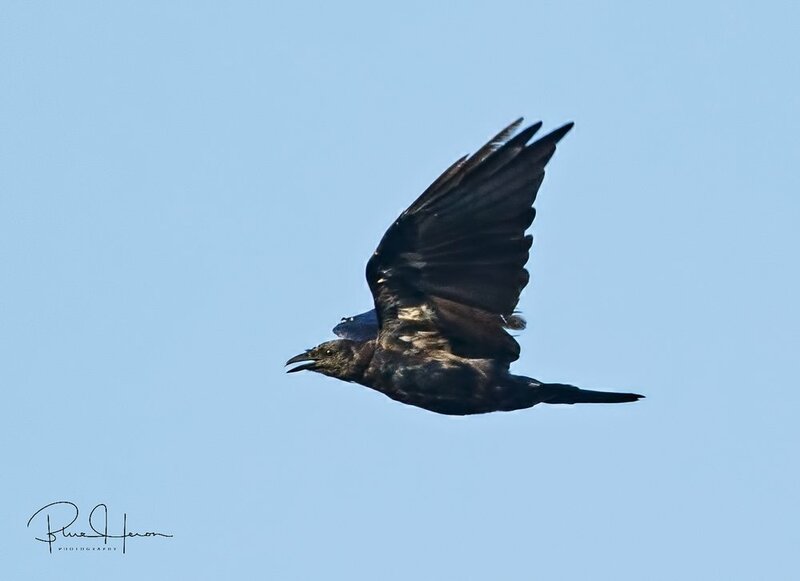 However, each year this family arrives in the late spring, raises a new generation (usually one), and about mid September, leaves the area for parts unknown until next year’s breeding season. George has not been too cooperative this year posing for photos but I have managed to capture a few. George Jr. sure likes to sleep a lot and has been caught snoozing on more than one occasion, especially in the family photo. The Word tells us to consider the birds of the air, they neither toil nor work yet our heavenly Father feeds them. If He takes care of them so lovingly I know we will be just fine too. The storm may come and leave us homeless but not without hope. If we have our family, we have what we need. And God will take care of the rest. We are part of His family after all. George Sr, the patriarch of the Yellow-Crowned Night Heron family poses on a new perch my neighbor set up for me. I had the new perch set hoping that the Belted Kingfishers would start to use it. 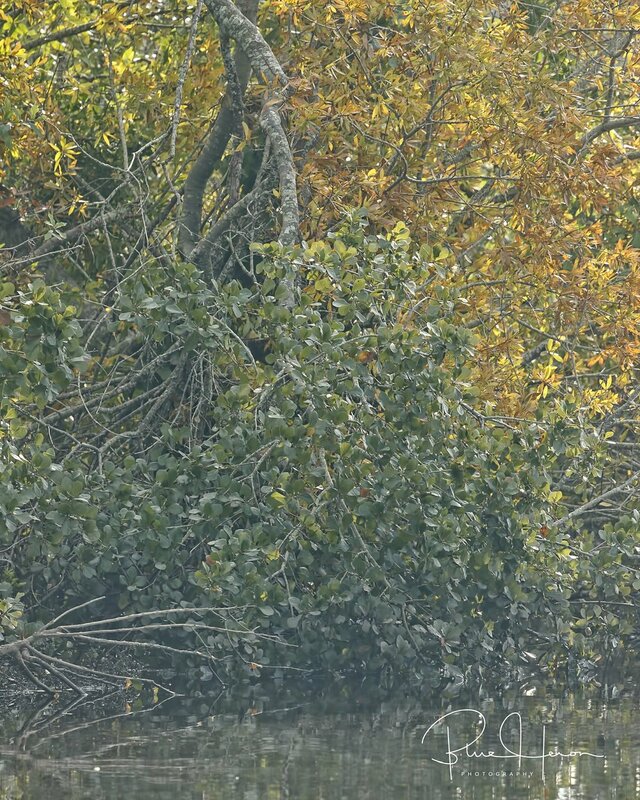 They recently returned to the Broward and indeed have discovered the perch. This is Spunky the female as she announces her presence. 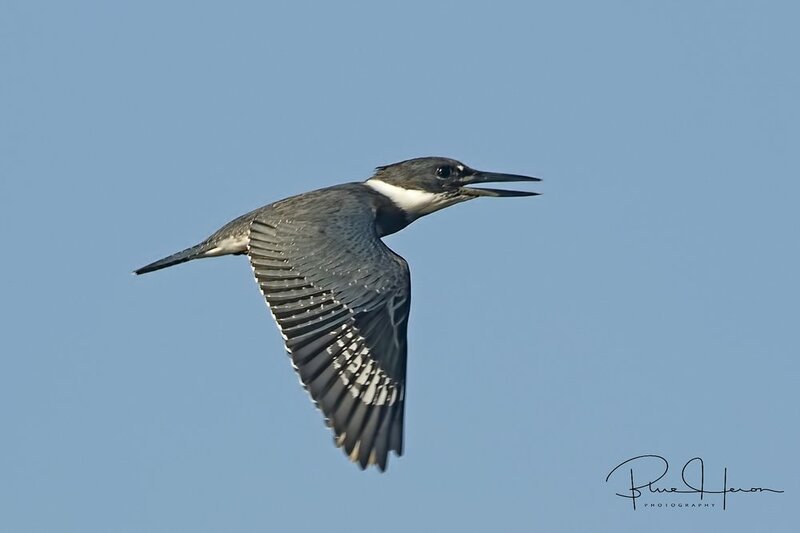 The brown belly feathers or "bra" differentiate the female from the male Belted Kingfisher. Family photo of Georgia and George Jr...note that Jr is sleeping again..
As September arrives on the Broward, one of the anticipated birds that I love to photograph is the Great Egret. 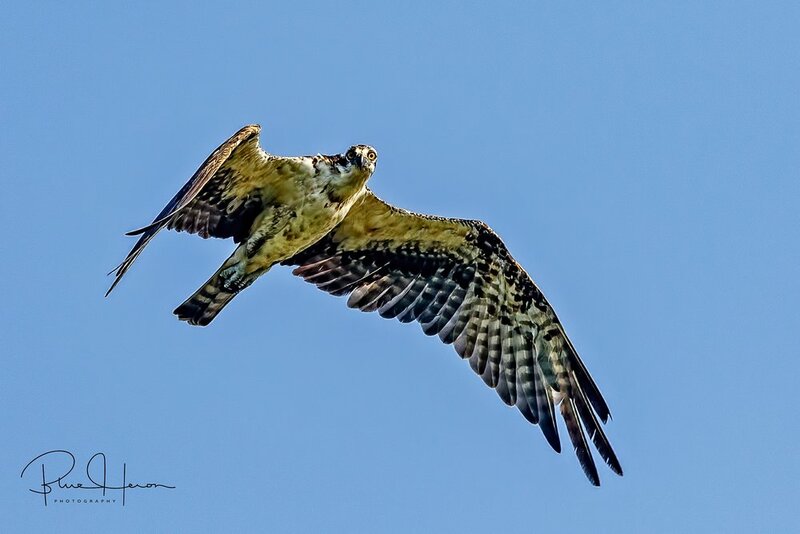 The coming fall season provides great opportunities for capturing this bird. However, the all white coloration does present a challenge to properly expose with the doohickey. 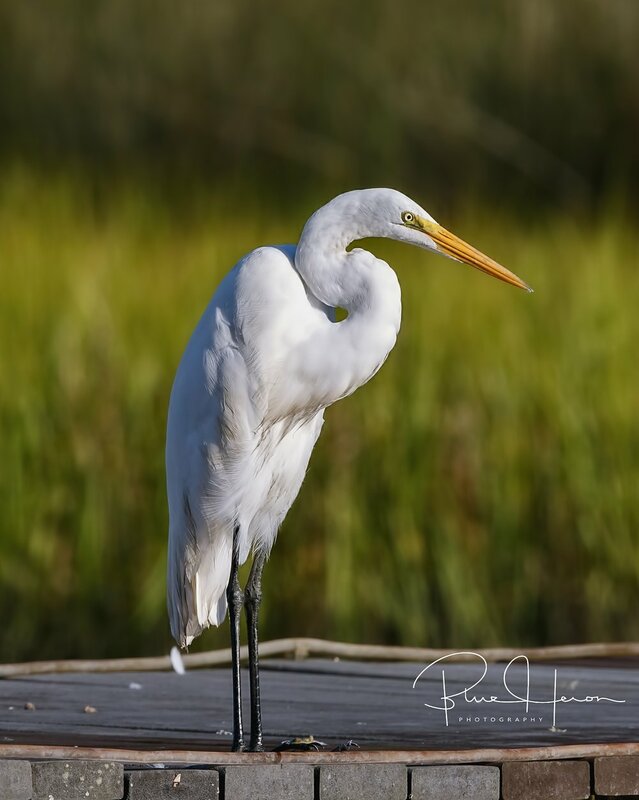 How do you tell a Great Egret from the other white Egrets? Yellow beak, black feet!. The smaller Snowy Egret has just the opposite, black beak and yellow feet. 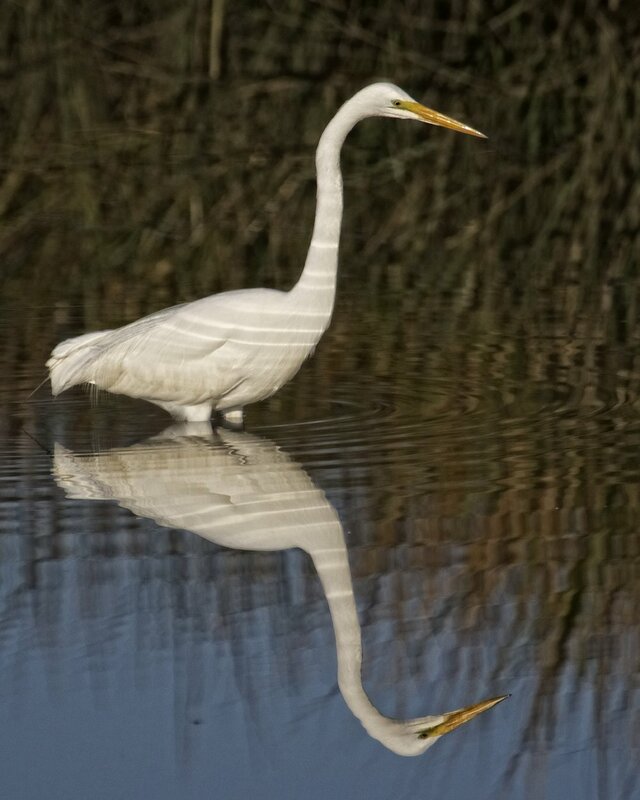 Per Wikipedia, The Great Egret (Ardea alba) is also known as the common egret, large egret or great white egret. The four subspecies are found in Asia, Africa, the Americas, and southern Europe. 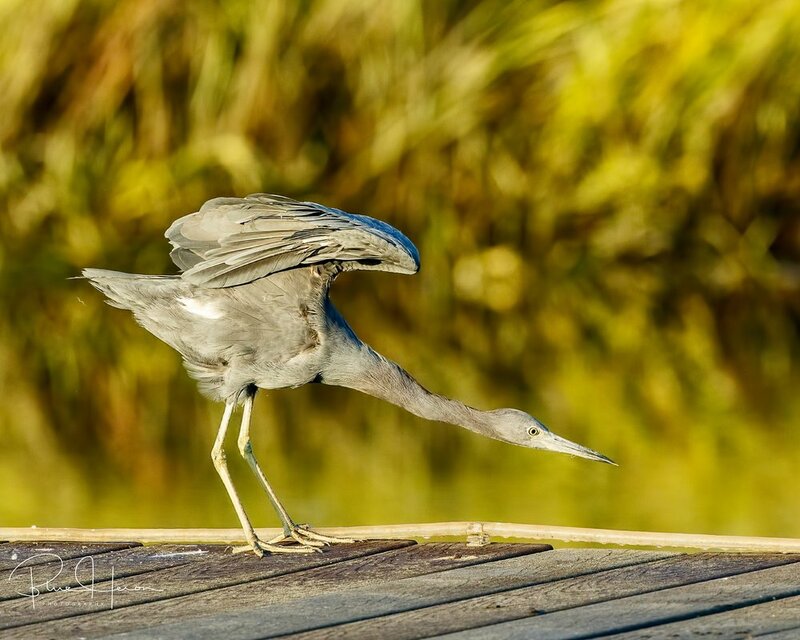 When observed in flight, they are slow and graceful and one of my favorite subjects (the Editor calls them the Bride of the Broward). During breeding season they exhibit delicate ornamental feathers on the back and have an emerald green coloration around the eyes. 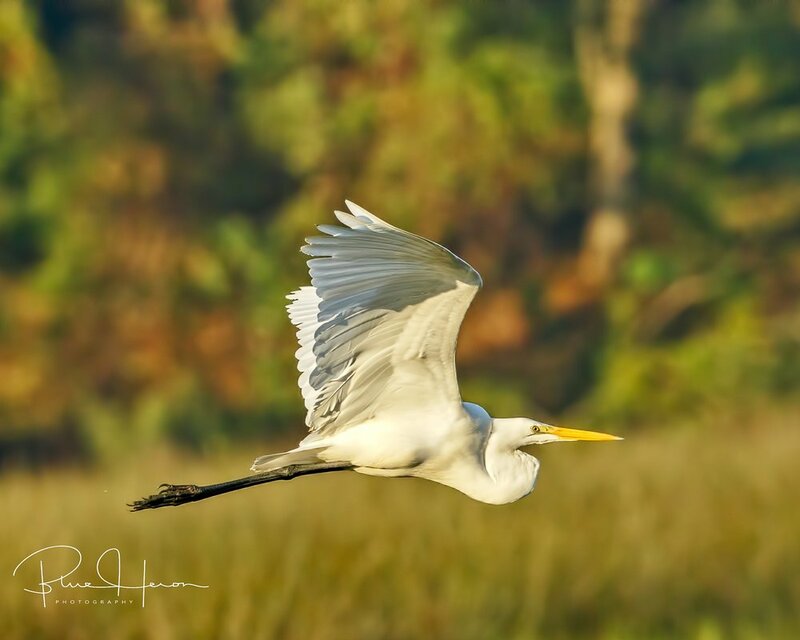 In 1953, the great egret in flight was chosen as the symbol of the National Audubon Society, which was formed in part to prevent the killing of birds for their feathers. I often see one particular Great Egret in its favorite fishing hole close to my dock. It just stands and waits until the unsuspecting prey (fish, minnows, frogs and reptiles) swim by and then it strikes with a quick lunge, stabbing the prey with its beak. 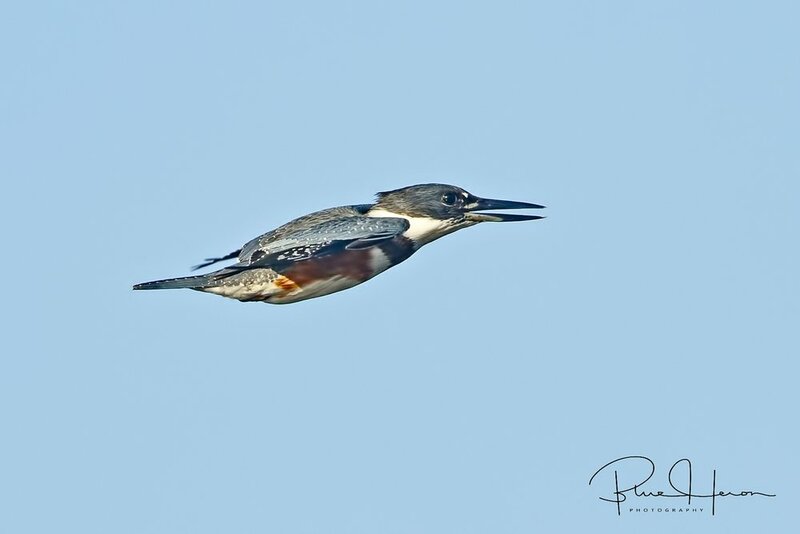 When I see this bird flying by the words of the epic hymn, “How Great Thou Art” come to my mind. The power and grace of their wings remind me of the power of and grace of our Almighty Maker. We have recently seen the power of a storm and the devastation it can bring. Now it is time for all us more fortunate ones to exhibit the grace and power of love in giving to our fellow Americans who recently weathered the storm. Blessings, Harry. 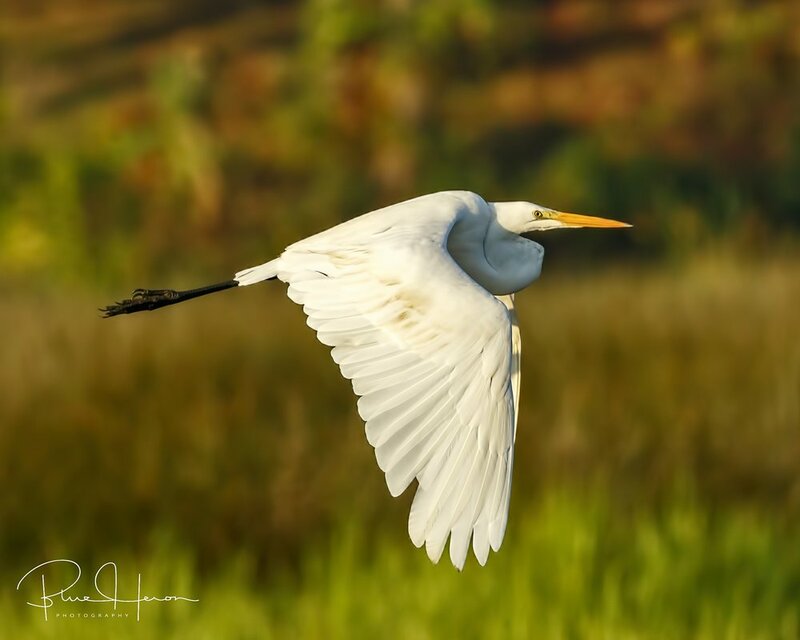 A graceful and elegant bird, the Great Egret is one of my favorite birds to photograph. 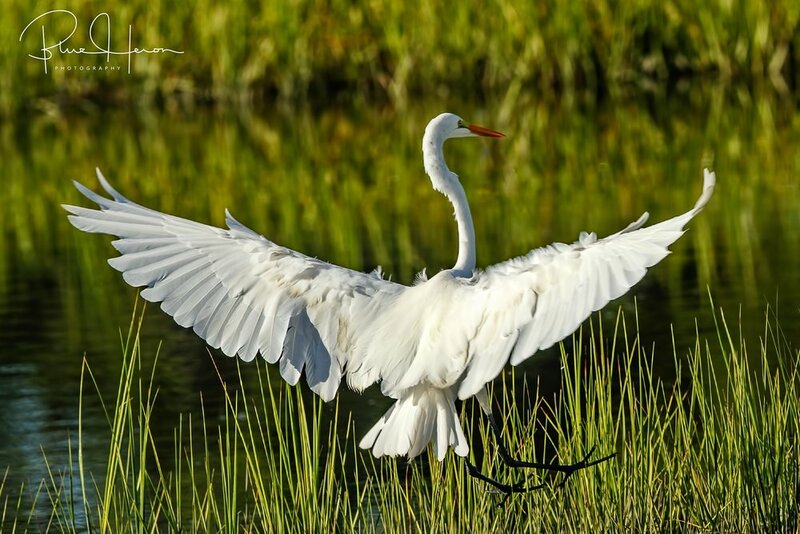 Found in Asia, Africa, the Americas, and southern Europe, these large egrets with wingspans of six feet are making a strong comeback after being hunted primarily for their feathers. A yellow beak and black feet distinguish the egret from its smaller cousin, the snowy egret. The all white feathers present a challenge to properly expose with the Doohickey..got an itch? The grace and beauty of their wings make me sing "How Great Thou Art"!